Purchased snack pellets are transferred to the Thermoglide2™ toaster. 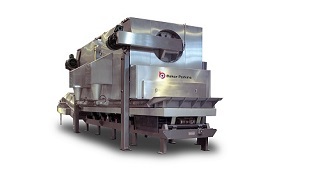 Controlled toasting and drying of pellets takes place in the Baker Perkins Thermoglide2™ toaster, where the fluidized bed process minimizes product damage. An innovative process that uses hot air as an alternative to frying to convert pellets into a finished snack; no oil is absorbed during the expansion process. The product is lifted and tumbled gently to ensure even processing with minimum damage. The process utilizes the proven Thermoglide2™ toaster. A niche sector of the snacks industry expands, flavours and packages extruded pellets, often as supermarket own-label brands. Conventional frying absorbs oil to create a product with a high fat content. Hot air expansion is an alternative, typically reducing oil content from 30% to 10%. The pellets lift and turn in a hot air stream, giving an even application of heat which evaporates moisture with no risk of burning. The expanded product can be coated with an oil based flavouring to create a flavor profile to which consumers are accustomed. 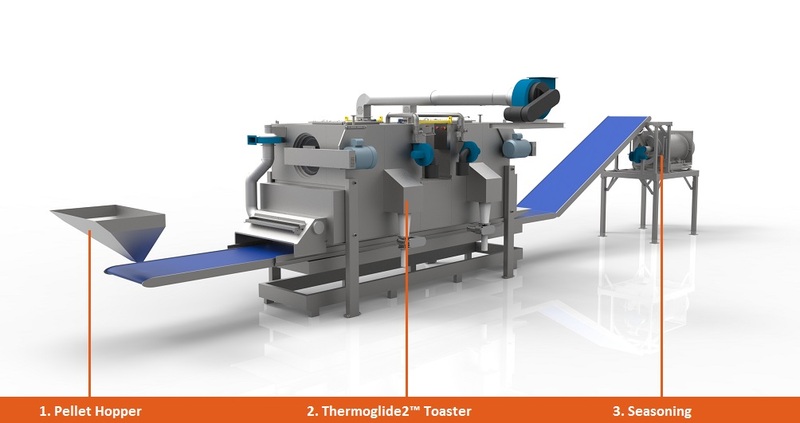 The Thermoglide2™ has been designed for continuous expansion of snack pellets and combines excellent processing with efficient dust extraction in a compact and energy efficient unit. A fluidized bed applies heat gently and evenly over the entire surface of the product. Two zones with independent setting of temperature and airflow rates allow process conditions to be tailored to product requirements. The heat-stable vibratory conveyor ensures consistent residence time and long-term reliability. PLC control provides repeatable process settings. Air extraction can be set to the minimum level required by the process without affecting product quality. Optimum fan and motor sizes minimize energy consumption. The amount of excess air circulating is reduced by compact design. Start up is rapid, a maximum 20 minutes from cold. Four machines are available to match plant widths of 600, 1,000, 1,300, 1,600mm.